Share your story of how Queen B Candles enhance your life. Send us an email, or post a photo to Facebook or Instagram – and tag us so that we can share in your beautiful moments. Regardless of where you sit on the ‘spiritual spectrum’, it is difficult to deny that a product made by a skilled and nurturing hand is generally superior to one churned out of a machine (there are, of course, many exceptions). It is little wonder then that many of the world’s luxury brands still choose to have their products made by hand as there is a level of care and attention that a product being made en masse just don’t have. There is a certain hallmark of a hand made product where every item is unique. Certainly in beeswax candle-making no two days are the same. Every candle is hand-poured or hand rolled. Every candle is hand wicked. Every candle is finished by hand. If you line up the tealights in a box, you will see that no two are exactly the same. So why do we continue with this (same may say foolhardy) method? It’s mainly due to honour. Showing honour to the bees and our beekeepers who work extraordinarily hard to make and then harvest a beautiful beeswax for us. And honouring you and your choice to spend your money on Queen B candles. It’s a choice that we’ve made in this fast paced, mass produced, compromising world to slow it down. Queen B is team of 3!! We may appear to be a large business, but Queen B is a team of 3! We have a part time candlemaker doing the poured candles and a part time order packer helping to pack the orders. Then there is Sarah, full time, who prepares the invoices, packs order, takes care of the retail store, answers the phone, responds to emails and enquiries, orders for the shop and business, makes a killer cup of tea and uploads product on the website. And there’s me doing the candle rolling, packaging design, bookkeeping, PR, marketing, newsletters, product development, painting, training and all logistics. At the end of every email you send, every order you place, every product review you write is either Sarah or myself grinning broadly (well, Sarah is British, so it would be the slightest of smiles, but I know she is bubbling with excitement deep down)!! We LOVE your photographs. We LOVE your anecdotes. We LOVE knowing when we’ve done something well (and even when we haven’t). We LOVE it when you acknowledge the handwritten note with every order or the extra gift that we put in with larger order (about 98% of people don’t acknowledge the extra gift). We all genuinely care that you have an incredible experience with you come into contact with Queen B. We make by caring hand, we pack by loving hand because hands are one of the things that make human beings unique amongst mammals and we think it’s worth using them to good purpose. Share your photos with us anytime, and be sure to tag us when you post to Facebook or Instagram. And don’t forget to sign up to our newsletter HERE for exclusive offers and updates on everything happening at the Hive. As humans we are naturally drawn to beauty… but what keeps us interested is substance. What’s there when you scratch the surface? There is something primal about the light and warmth provided by a candle flame. We are drawn to its natural light. As civilisation has progressed, the use of candles has changed from being functional to a tool used to create an ambience – be that for meditation, relaxation, romance, entertainment or atmosphere. More recently, candles are no longer just being used for special occasions, they’re being used to find calmness in our busy lives. Their beauty is now part of our self-nurturing practices, adding to moments of stillness and reflection. We consider it a privilege to be part of these moments. It is an extra-ordinary honour to make light for a living … to make light that is good for you and for the planet. Here’s a couple of ways that Queen B candles do that. Burning a beeswax candle is said to be a natural ioniser. What is ionisation? Ionisation is the addition or removal of an electron to create an ION. Dust, germs, allergens, pollution etc are positively charged ions that float in the air. A beeswax candle is said to emit negative ions when burning. The negative ion attaches to the positive ion to create an atom and as an atom is heavier than air, it drops to the ground (or is drawn into the pool of wax). I was recently speaking to a retailer of many years who had been burning our tealights for years and towards the end of the conversation she mentioned that our latest batch of tealights weren’t burning very well. As we order tealight wicks 100,000 at a time and we’re about 60,000 wicks through the latest batch with no previously reported issues, and our know our wax well and knew that wouldn’t be the issue, I started brainstorming it with her. Was the tealight on a level surface… yes. Was it being burned on a very warm or cold surface… no. Had anyone started renovations nearby recently?… yes, there was a new shopping centre going up over the road. Voila! A beeswax candle is a natural ioniser… so it was busy working it’s little heart out drawing all of the new airborn particulate matter into the pool of wax clogging the base of the wick. Funnily enough, we had an even more passionate retailer after that as she understood yet another benefit of burning beeswax candles. We also suggested that she switch to burning pillar candles as the larger wick makes it better able to cope with dirt in the pool of wax and would provide even greater ionising benefits. If non-toxic was a luxury, Beeswax candles would be the ultimate luxury. We’ve been working on our Black Label range for 2 years since the original idea. Shortly we will be unveiling to you our Black Label range. It’s an idea that we’ve been working on for 2 years. My dream was to create an exceptional range of Queen B candles and to create packaging for them that was as exquisite, useful and timeless as the candles themselves. Packaging that was as luxurious as a hand crafted, natural beeswax candle is in this day and age of toxic products churned out en masse from machinery. Firstly, I had to find a way of not creating packaging that would simply create more landfill. So, we’ve created boxes that are so rigid, so well crafted and so stylish that we believe they’ll have many lives post the Queen B candle that comes in them. It means we’ve printed all the product information on a paper sleeve you can feed to the worms, compost or recycle and you’ll be left with an exquisite black box with just the most subtle and stylish little Queen B moniker on it. And the candles in them… well they’re a little something special to which we’ll be unveiling to you very shortly! We all need a little time out to ourselves to reflect and re-energise. Give yourself the gift of pure, natural, beautiful light. 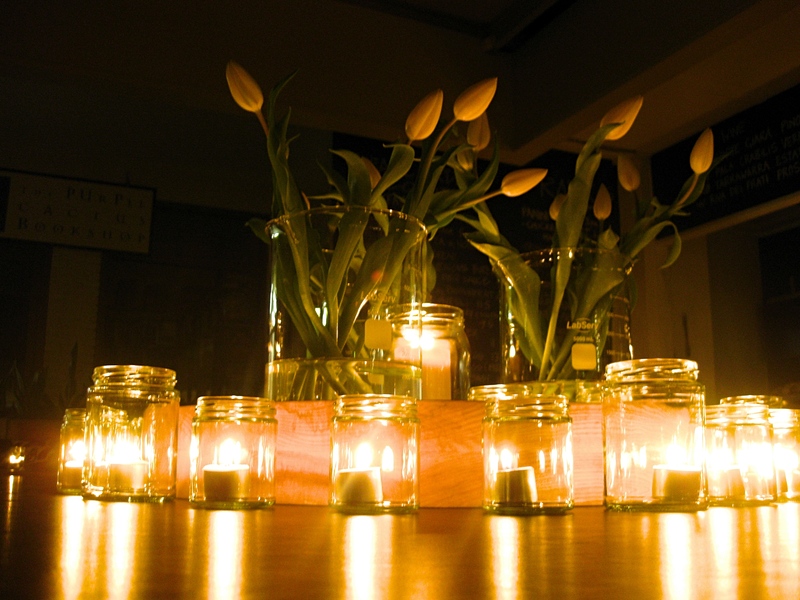 You can check out our beautiful selection of natural, 100% Pure Beeswax candles HERE. Or get exclusive deals by being a part of the Queen B community by subscribing to our newsletters. For more than 14 years we have been lighting up lives with our handmade, pure, unadulterated, natural light. And after 2 years of development, we will very shortly be launching a stunning new luxury line of products. This whole process has allowed us to reflect on what our values are… they’re old fashioned principles that have allowed us to become the premium brand of beeswax candles globally that we will be holding fast to as long as our products are lighting up your homes, businesses, weddings and events. At Queen B we only use 100% pure Australian beeswax in our candles – because it is Australian and of the highest quality in the world. Unfortunately, over 90% of candles sold in the market are made from paraffin – a petro-chemical by-product. Pure Australian beeswax costs around 50 times the price of bulk paraffin and 20 times the price of hydrogenated soy or palm oil. Australian beeswax is the most expensive beeswax in the world (because our wax is free from chemical miticides). There are plenty of cheaper offshore alternatives available, but we will never compromise. You can be confident that you will always get a superior product when you buy a Queen B Beeswax Candle. We clean and filter our wax for 72 hours using a proprietary method prior to ever pouring a single candle from it. This is one of the primary differences between a Queen B beeswax candle and other beeswax candles on the market. Why? To ensure they burn beautifully! There are two major ingredients in any candle… wick & wax. The wick draws the wax up the wick (via capillary action) to fuel the flame. If there are impurities in the wax, that will affect the flame. Too much pollen (yellower waxes) and the candle will likely smoke, and drip. Too much propolis (browner waxes) and the candle will have a small flame and not burn properly. And then there’s the dust in the wax because hives are often placed in national parks the presence of which will clog a candle wick. We have over 500 different pure cotton wicks to choose from when we’re working on a new candle. This is the second most important ingredient in any candle. To ensure we choose the ‘right’ wick, we do wick testing which can take many months. During wick testing, we film the candles burning, take photographs and have a half hourly alarm that goes off for us to visually observe the burn and make notes. Luxury is in the finer details of a product. By purchasing Queen B candles, not only are you getting an extra-ordinary gift for yourself or someone special, but you are also giving on many other levels – to your health (by purifying the air you breath), to the environment (no toxic smoke), to regional Australia (supporting beekeepers and their communities) and to a talented community of artisans (who assist with the making of Queen B candles).